I am going to add my two cents worth here. I have given this a lot of thought. I am going to go with the Duke and Duchess of Clarence for Prince Harry and Meghan. My second choice is the Duke and Duchess of Connaught. Either one rounds out the C’s for the Wales men. The Duke of Cornwall and the Duke of Cambridge. Reflections on the royal wedding...I've been waiting for this day a long time! Prince Harry has always had a special place in my heart. He couldn't have chosen a more perfect partner to share his life with. Being a huge anglophile, I am beyond proud that Meghan is American and hails from my home state. What a beautiful woman and soul she is. Her wedding dress was so classic and so lovely. Perfect. I'm so happy she wore a tiara and one that we have not seen since the 30's (I'm hugely into the jewels of the Royal Families of Europe, but especially of Great Britain). 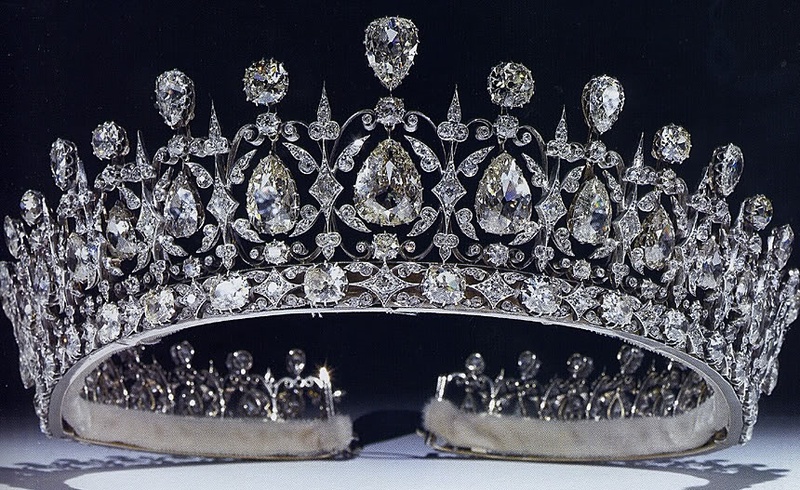 Queen Mary's bandeau tiara was such a gorgeous choice, and it will become Meghan's tiara now to wear at royal functions. I was thinking that Harry would have a new one made that would be uniquely hers, but since the bandeau hasn't been in use for so long, it's basically like seeing a new tiara. Her veil...oh my, how dramatic and how stunning. She paid tribute to all 53 countries of the Commonwealth with her 5-meter long wedding veil, which represented the flowers of each Commonwealth country. She also incorporated two flowers with personal meaning: Wintersweet (Chimonanthus praecox), which is grown outside her Nottingham Cottage home with Prince Harry, and California Poppy (Eschscholzia californica), the state flower from her place of birth. Meghan’s veil also included crops of wheat delicately embroidered and blended into the flora, to symbolise love and charity. I was so pleased to see Harry choose to wear a wedding band on his wedding finger. William chose not to. His father wears a little pinky gold band with his signet ring. Prince Phillip also shunned a wedding band. Good on you Harry! The flowers were amazing decorating all the archways and entrances...just stunning. I also loved how the seat next to William was empty...because it reserved for his Mom, Princess Diana. Meghan incorporated some of Diana's favorite flowers into her bridal bouquet. So many happy memories made today! It brings me back to that day in July 1981 getting up early to watch his Mom and Dad get married. I'll leave with 1 Corinthians 13:4-: "...Love is patient, love is kind. It does not envy, it does not boast, it is not proud. It does not dishonor others, it is not self-seeking, it is not easily angered, it keeps no record of wrongs. Love does not delight in evil but rejoices with the truth. It always protects, always trusts, always hopes, always perseveres..."
Many, many congratulations to the new Duke and Duchess of Sussex!!! I agree, it was a great wedding. I really enjoyed watching the royal wedding. I think that the new Duke and Duchess of Sussex are a perfect couple and wish them both every happiness. All my best to the happy couple! That was never going to be an option. Both Clarence (for County Clare) and Connaught are in the Republic of Ireland- and are no longer part of the UK, so will not be able to be reused for the British royal family. Clarence does not refer to County Clare in Ireland, but to the town of Clare in Suffolk. It was first created for Lionel of Antwerp, who married the heiress of the de Clare Earls of Hertford and Gloucester. Clarence is thus the de Clare inheritance. Harry and Meghan are now expecting their first child. Congrats to the two of them! Wonderful news! I believe that the baby is due in the spring.